Please find us on http://www.wheelsonourfeet.com and follow us there. Currently, we are writing about Kolkata, the all so magical city of arts, literature, music, dance, poetry, food, architecture, history. We have moved to our own domain at http://www.wheelsonourfeet.com. Request you to please join us at our new site and extend to us all the support you had been providing us so far. 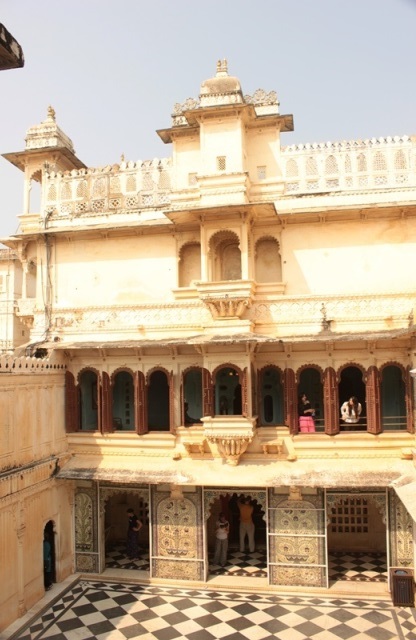 If you have been to any Palace in India, you would have gaped at the ornate windows that most of these palaces had. They were the windows where the women-folk of those times stood in order to peek at the world outside. When within the palace, looking out into a big courtyard or court, women would use these windows to follow court proceedings or court entertainment. As a woman myself, it gives me no pleasure to think what these windows would have meant to women of olden times — the only way to see/connect with the outside world! No matter how ornate, they were like cages! This deep-rooted inequality between men and women is what still keeps India socially backward. Although a lot of progress has been made to bring in equality, we need to achieve so so much more….. This has been a ritual ever since I can remember. We’d wake up early in the morning, shower quickly and leave for the famous Kali temple in Dakhineshwar. The temple is revered by millions and is always thronging with devotees coming from far and wide, who normally take a dip in the banks of the Hoogly flowing by the temple premises, and then queue up to offer their prayers to Goddess Kali. Believers feel strongly about invoking Goddess Kali’s blessings for important occasions/landmarks, starting of newer projects, thanksgiving here. Saint Ramakrishna Paramhansa attained his sainthood in this temple. Dakhineshwar was also where Swami Vivekananda turned to when he renounced worldly cares. Have heard that Tuesdays and Saturdays, New Moon days are generally more crowded. Plus, the new year and festivals in the Hindu calendar also draws devotees by the hordes. Once inside the premises, spend some time taking a look at the simple, yet beautiful, architecture of the main temple and the smaller ones (which are dedicated to Lord Shiva) overlooking the river. When not very crowded, this place can be very calming. 1. Timings of Dakhineshwar Temple: The temple opens at 6 am every day and shuts at 12.30 for the noon. It reopens at 3 pm and shuts a little after the evening aarti around 9 pm. 2. When Is The Best Time To Go To Dakhineshwar Temple? Early mornings are very nice, but then, the evening Aarti is also one experience that you shouldn’t miss. However, try to avoid the mid-day, i.e, post 9am. Is usually crowded around then until noon. 3. How To Reach Dakhineshwar Temple? 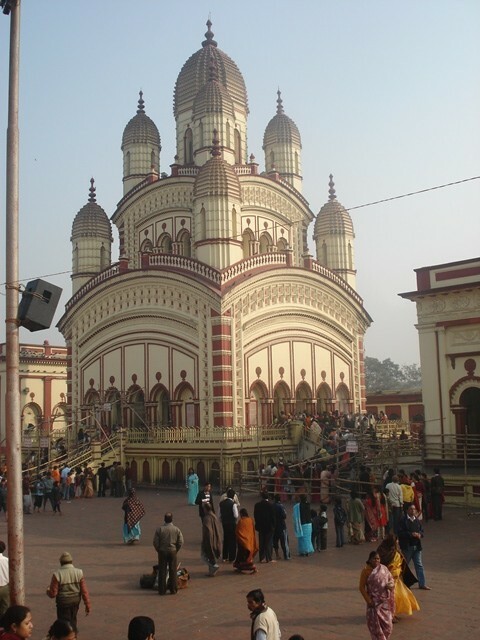 Dakhineshwar Temple is in North Kolkata and is well connected by local train, bus, taxis and rickshaws. The local train station is called Dakhineshwar and is connected with the Howrah line. The nearest metro station is Dum Dum. 4. Can You Buy Flowers & Offerings @Dakhineshwar? Yes. There are many stalls just outside the temple premises that sell flowers, garlands, incense sticks and offerings at various prices ranges. You can buy the basket from any of these vendors and upon completion of your Puja, come back to the same stall where the vendor will give you a bag to carry back the flowers and offerings. You can also leave your shoes/sandals here before you queue up for the Puja. 7. Are Foreigners Allowed @Dakhineshwar Temple? Yes. Know some temple in India do not allow non-Indians. I find that ridiculous. Thankfully, Dakhineshwar Temple has no qualms allowing people of any religion inside their premises. 8. Shopping @ Dakhineshwar Temple: Once again, stalls outside the temple premises sell a whole lot of puja items. You get plates and glass made of stone, brass etc. Take a look if you’d like to buy anything for your own house or for a friend/relative. Call it idiosyncrasy, but I hate dining in malls. That’s because, I feel that the character of a place is lost when it is holed up in the same line with many others. And that’s why, we had never been to Indigo Deli at their R-City Mall joint in Ghatkopar, despite being huge Indigo Deli fans. But last Sunday saw us breaking our own self-imposed exile. After one huge shopping spree at the Mall, we hopped on to Indigo Deli for both the throat and stomach!! And was happy to find that none of the mall crowd had spilled over at the Deli. Perhaps it’s the Deli’s niche menu, pricing or both. But thank goodness to whatever it was. For we could were in the mood for some quiet drinks over some quiet food, on a day that had started very early, seen us run 10 km and then, indulge in binge shopping. The ambience @Indigo Deli was perfect! A spacious place with expensive and well-thought out décor, it oozed charm. We opted for a table for 3 by the large windows in one corner so that we could get a sense of the place. Food @Indigo Deli, R-City Mall: Our biggest fear with any chain, no matter how successful or reputed, is that they are unable to recreate that same magic which made their original joint famous. Well, sometimes, that fear is well founded. But, happily, it didn’t apply to Indigo Deli at R-City – the food was as good as their Colaba joint!!! Jayant has this HUGE weakness for their BBQ Pork Ribs, which he notoriously orders every time he is at the Deli. He ordered it this time too, saying that the dish would be the litmus test in order to find out if they really match the Colaba food in taste! Be happy, I said, for I wanted to go with my favourite – Lambs with Aubergines and Fruit Compote. And in order to further tighten the ‘litmus test’, we ordered the Deli’s famous Quiche of the Day. The staff taking our orders, confirmed that the Quiche would be of shredded chicken and leeks. So be it, we said. To down this all, Jayant ordered Beer and I settled for a Red. The Quiche was YUMM!! As usual. My ever-discerning daughter loved it and so did we. First litmus test, Passed. The Pork Ribs were just up to Jayant’s fancy and so were my Lamb dish. I only wish I had asked for a little more helping of the yummy fruit compote. Blended perfectly with the aubergines and the wine. The quantity served was, as is usual with Indigo Deli, huge. The 3 of us had trouble finishing it all. And much as we would have liked to order the Mousse lying at the Desserts counter which tempted us upon our entry, we figured we couldn’t look at any more food than what we had already had! @Indigo Deli, R-City Mall, Expensive? 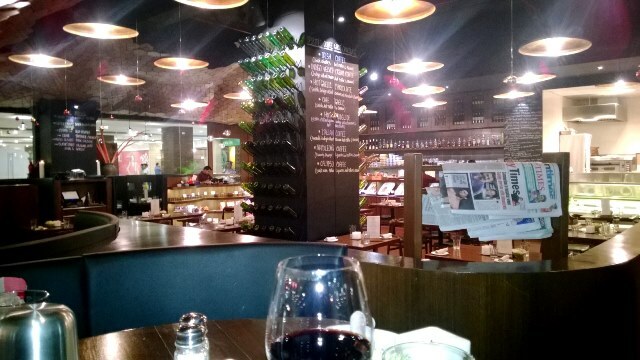 Well, for the newbie, Indigo Deli is gourmet cuisine. Which is why the ‘expensive’ tag. Meal for 2 with drinks can easily go up to INR 3500. So the next time we are tied for time and energy to drive down to Colaba, we will head to Indigo Deli at R-City Mall for a GOOD meal. Yes!! Food @Indigo DeliFood @Indigo Deli in R-City MallR-City MallRestaurant Review: Indigo Deli @R-City Mall MumbaiWhere to eat in R City Mall? We had drawn up a list of must-eat joints in Kolkata much in advance lest we should miss out on any good food this Christmas holidays. Bohemian was high on our list, for this fusion rood place had made quite a name for itself in the recent past. The food is however exceptional and definitely different. Started by Chef Joy Bannerjee, ex-chef of the Oberois … , Bohemian uses exotic Bengali spices like Panch Phoron (Bengalis’ famous 5-spice mix), Sorshe (Mustard paste, but of course) and Gondho Raj Lebu (a lemon known for its wonderful aroma) to make variants of global dishes with a Bong touch. We had had a very heavy fish-centric lunch and hence, were not very hungry. That’s why we hit the main courses straightaway, missing out on some excellent starters which, we couldn’t help observing, were presented in true 5*-hotel style to the other diners. Some good wine, cocktail would have been awesome, but they do not have liquor license yet. Mock tails were our only option…. 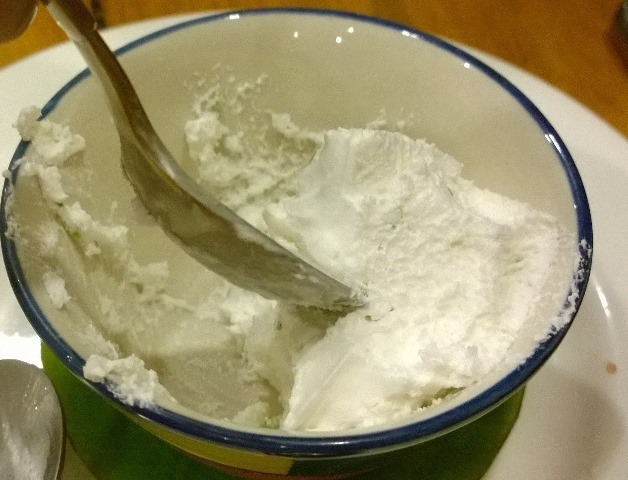 For deserts, we opted for Gondhoraj Soufflé – a must have … with the mild flavor of Gondhoraj lemon giving just the right flavor to the creamy soufflé base. The service was very good & quick though a little impersonal. 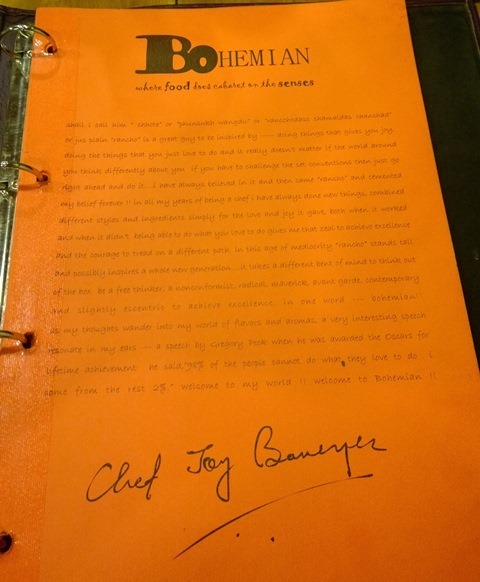 How much does it cost to dine at Bohemian? 2 mocktails + 3 main-course meals + 1 dessert = Approx INR 2000. Beat that!! Kolkata prices appear to be so delightful to a Mumbaikar! Where is Bohemian located? 32/4 Old Ballygunj, 1st Lane. Phone — 033 – 64601001. Advisable to make a call and reserve your table so as not to take chances! Would strongly recommend this place for a meal – preferably dinner, when one visits Kolkata and do try the Gondhoraj dishes, something to remember Bengal by when you are back home. 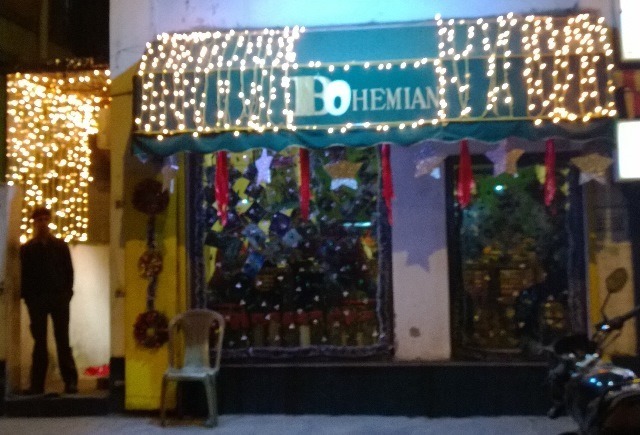 How much does it cost to dine at Bohemian in Kolkata?Must Ear restaurant in KolkataRestaurant Review: Bohemian in KolkataWhere is Bohemian located in Kolkata? How About A Sortie To A Fish Market in Kolkata? If there be Fish Heaven on earth, it is here it is here. In Kolkata. There can be no disagreement on this, what say? Bengalis live and die for their fishes. With a ‘macher bajar’ (fish market) in every neighbourhood, every Bengali will hop out of their house immediately after their morning cuppa to get the best catch. And why not? For it is only here in Kolkata that you will find the fishes ‘alive and kicking’ when still up for sale. Which are the most famous fish markets in Kolkata? Howrah wholesale fish market, Maniktala in North Kolkata, Gariahat in South Kolkata, Kolay in Sealdah are famous not only for the wide variety of fishes they procure but also for their stellar quality. Prices depend on the fish you want. The staple ones are competitively priced. However, the special fishes such as Iilish, Chitol, Chingri can go for some ridiculous pricing. But that’s no deterrence for the fish lover who can’t do without it in his lunch! Notice the pot-bellied man in the picture standing alert as the fish-vendor cuts his choice of fish? That’s the love we are talking about!!! Fish Market in KolkataHowrah Wholesale Fish MarketKolkata Fish MarketsManiktala Fish MarketWhich are the most famous fish markets in Kolkata? First, a very Happy New Year to all of you, although the ‘New Year’ is already almost a week old now. I must apologise. But let me also explain — the 11-day whirlwind tour of Kolkata was both exhilarating and exhausting. And so, took time off to recover from complete lack of sleep and rest. 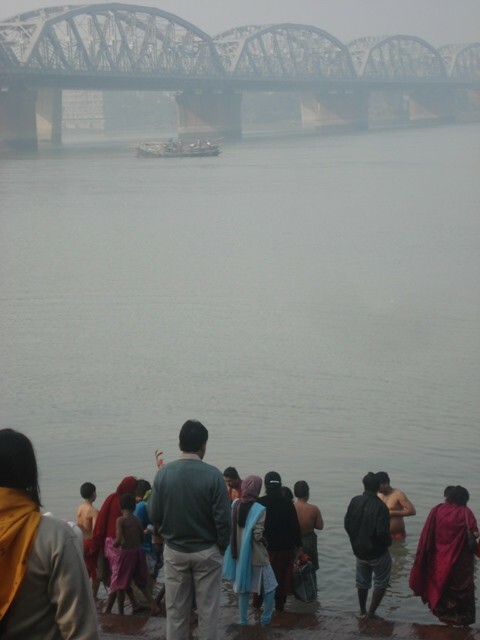 Starting the new year’s chronicles with Kumortuli in Kolkata — Truly the place where Gods are made. What is Kumortuli? For the benefit of those who are new to the word Kumortuli, here is the orientation — Kumortuli is the potter’s colony where idols of Hindu Gods and Goddesses are made. ‘Kumors’ are the idol-makers. 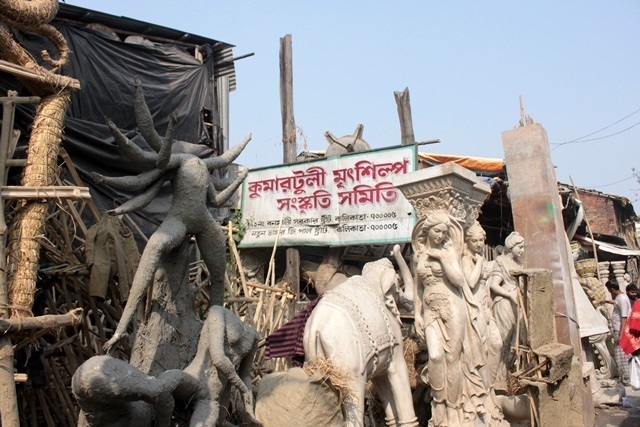 Kumortuli in Kolkata is famous for being the biggest colony of idols. Idols made here are worshipped not only in Kolkata or the other cities of West Bengal, but they are also sent to different cities in India and abroad. Such is their workmanship with clay procured from the banks of the rivers Ganges and Hoogly, that many Kumors even travel to different cities to make idols. Over the years, Kumortuli has been made even more popular by movies and media. The place is a photographers delight. Once here, you will want to spend the rest of the day with the potters and the artisans, marvelling at their painstakingly patient work and minute and detailed workmanship. My daughter refused to budge. She wanted to learn how they straightened the straws, bound them to different shapes and sizes, plastered them with well-beaten clay, gave shape, moulded the faces, drew the fingers, coloured the eyes, dressed the idol and decorated it. Truly a place for both children and grown-ups!! 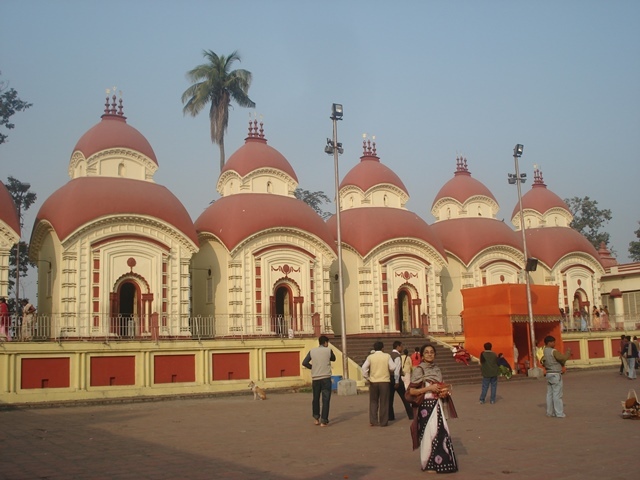 Where is Kumortuli Located in Kolkata? Kumortuli is located in North Kolkata, very close to Shobha Bazaar. There are no taxi-drivers or bus-drivers in Kolkata who do not know this famous place. You simply have to utter the name Kumortuli and just about anybody will guide you to the right street. In case you plan to take the metro, alight at the Shobha Bazaar metro station, walk out and ask for directions. It is walking distance. Is Kumortuli Open Throughout The Year? Yes. Although Kumortuli comes alive and roaring during the Durga Pujas when the Kumors (idol-makers) are in a frenzy to complete the idols of all sizes and types to be taken to different puja pandals within Kolkata and outside, Kumortuli gets a fair amout of work to sustain itself throughout the year. Plus, as the famous Bengali saying goes, baroh mashe teroh pabon, meaning 13 festivals in the 12 months of a year, Kumortuli is always flooded with orders of idols of Gods and Godesses. When we were there end-December, the potters were busy making the idols of Goddess Kali and Goddess Saraswati. 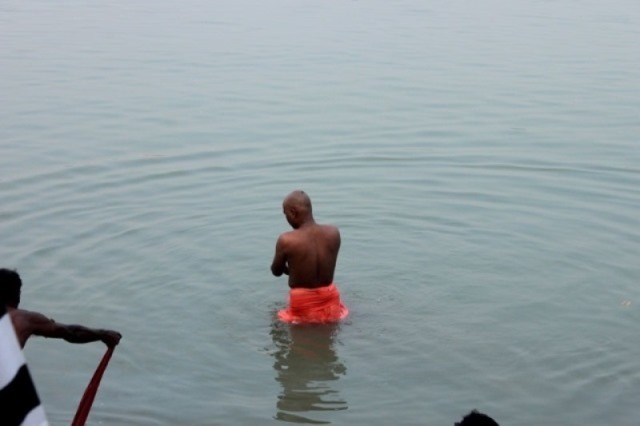 Are Outsiders Allowed In Kolkata’s Kumortuli? Upon enquiry, the Kumors told us that during Durga Puja, photography enthusiasts and visitors are allowed entry only via passes, in order to sanitise the crowd. During the rest of the year, you can walk into Kumortuli anytime. Walk down the lanes at a leisurely pace, strike a conversation with the Kumors and you will go back home/hotel richer with anecdotes and stories. Are Outsiders Allowed In Kolkata’s Kumortuli?How To Reach Kumortuli in Kolkata?Is Kumortuli Open Throughout The Year?Kolkata Kumortuli TimingsKumortuli in KolkataWhat is Kumortuli?Where is Kumortuli Located in Kolkata? 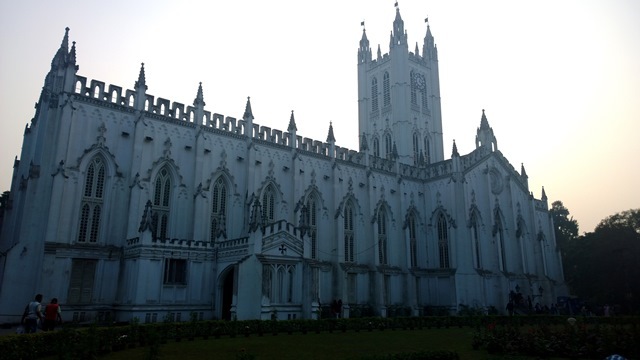 The lofty St Paul’s Cathedral is impossible to miss if you are anywhere near Maidan in Kolkata. I had been here when still a student almost 15 years ago. Jayant hadn’t. That surprised me, for he would visit Kolkata every year during his summer holidays when in school. And so I vowed to take him here and show him the majestic church and it’s beautiful grounds. Perhaps one of the first churches in India, St Paul’s Cathedral has seen India from the times of the British colony to the present day India, and has kept its doors open to its ever-changing faithfuls. How to Reach St’ Paul’s Cathedral (Kolkata)? Built in the beautifully landscaped green-zone of Kolkata, St Paul is close to Victoria Memorial, Birla Planetorium, Rabindra Sadan, Nandan. You could take a taxi or simply walk. Take the metro to reach Maidan or Rabindra Sadan. Or take the ever-so-romantic tram. Once in the streets, anybody will point to you the Church. We suggest you walk. St Paul’s Cathedral’s (Kolkata) Timings: Over the weekdays, the Chruch is open from 9 am to 12 noon, and again from 3 pm to 6 pm. Mass Timings @St Paul’s Cathedral’s (Kolkata):The Christmas Mass is famous in the Cathedral and draws devotees from all over Kolkata and outside. It is held at 8 am on the morning of Christmas. The New Year Eve’s mass is also a very big draw and upon enquiring we found that this year, New Year’s eve is be celebrated as the New Year’s Eve on the Labyrint. There would be a Labyrinth Walk in the Great Hall at 5:00 pm, followed by the Celebration of the Holy Eucharist on the Labyrinth in the Great Hall at 7pm. On New Year’s Day (January 1), the Holy Eucharist (Holy Communion) will take place at the Chapel at 10 am. Happy 2014 to all of you!!! Enter your email address to follow WheelsOnOurFeet and receive notifications of new posts by email. What people have been talking about! !